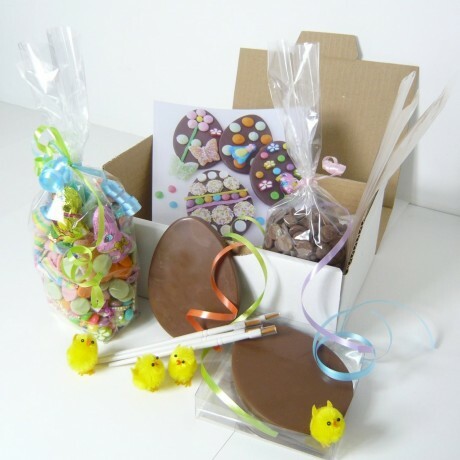 A lovely gift for children (or adults) is a fun chocolate Easter egg kit. Perfect for children's parties with lots of chocolate and sweets. 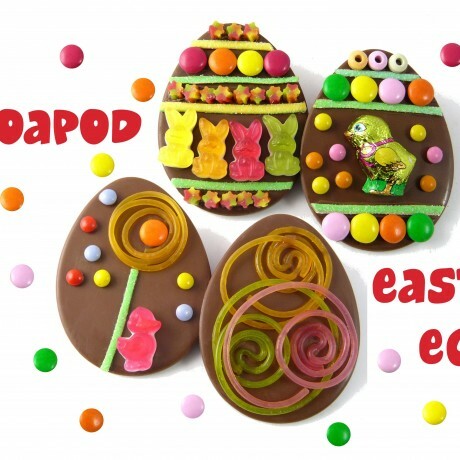 Each kit will make 4 Easter eggs so perfect for parties. Or do you need a corporate team bonding activity? Everyone would love making this kit for a chocolatey, artisitic fun day. 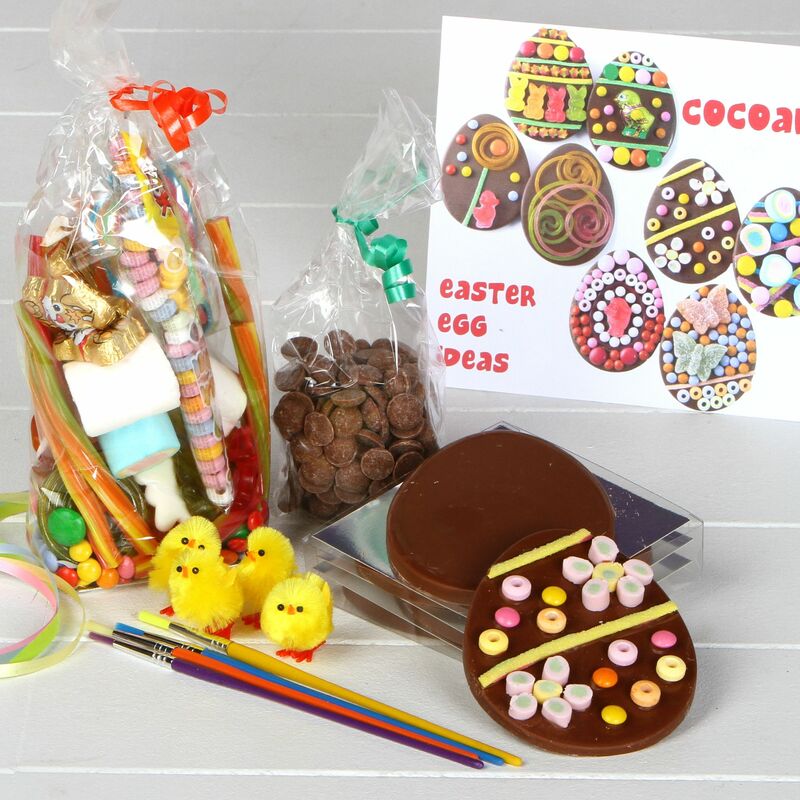 The Easter egg kit contains four milk chocolate flat eggs (40g each), an extremely generous bag of mixed sweets (300g) for sticking; in fact we have supplied many more than is needed because we know that as you stick one you eat a few too! Packaged in a simple white box.For use by young children with adult supervision. Milk Chocolate ingredients: sugar, cocoa butter, whole MILK powder, cocoa mass, emulsifier: SOYA lecithin, natural vanilla. Milk chocolate min. cocoa solids 33% & min. milk solids 21%. 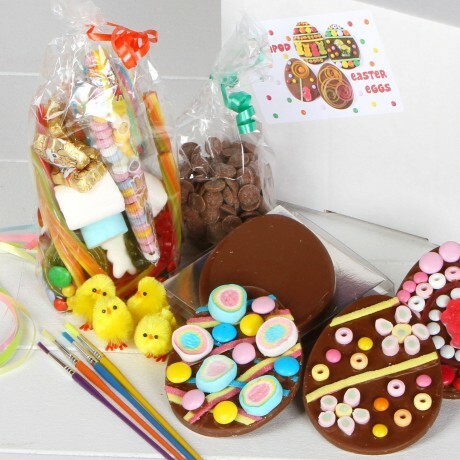 A selection of various sweets. All allergens are in CAPITALS. May also contain NUTS, WHEAT, GLUTEN, GELATINE or EGGS. A full list of ingredients will be supplied. Some sweets will not be suitable for vegetarians.